The long-awaited book The Self Does Not Die has now been published by IANDS and is available on Amazon.com. The project involved translating and expanding the Dutch book by NDE researchers Titus Rivas, Anny Dirven and Rudolf Smit. This new edition details 104 cases of veridical perceptions and other verified paranormal aspects of NDEs. Veridical perceptions in NDEs provide the best evidence of the apparent separation of consciousness from the physical body and, by implication, survival of consciousness after death. Available at Amazon & Kindle! IANDS was able to raise more than $20,000 for the project and there are now 104 cases in the English edition! The book features each case with all of the references that readers can use to explore the case further. These references include many on-line references with the links given. There is a handy on-line version of the Reference List on the IANDS web site where the links can be followed simply by clicking on them. In 2013, NDE researchers Titus Rivas, Anny Dirven and Rudolf Smit from the Netherlands published a book in Dutch which describes 78 cases of veridical perceptions and other verified paranormal aspects of near-death experiences. These perceptions are called “apparently non-physical veridical perceptions” or AVPs in the NDE literature, for example a cardiac arrest patient reports having seen an unusual event in a different part of the hospital which is later confirmed to have happened during the arrest, just as described. Veridical perceptions in NDEs that have been verified by third parties provide the best evidence of the apparent separation of consciousness from the physical body during NDEs. These cases strongly suggest that consciousness exists independent of the body and, by implication, survives death. 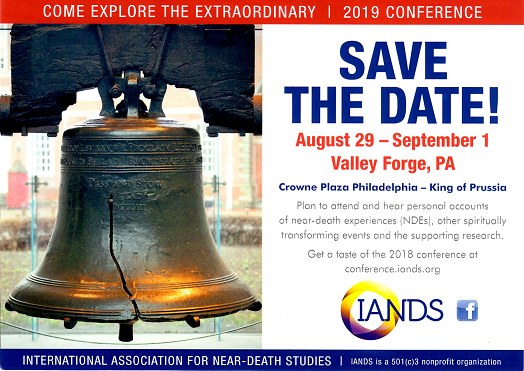 Investigation of AVPs during NDEs has been the subject of much experimental and phenomenological research in the field since 1988, including by NDE researchers Jan Holden, Bruce Greyson, Ken Ring, Michael Sabom, Sam Parnia, Peter Fenwick, Penny Sartori, Pim van Lommel and Kim Clark Sharp. This evidence has also been used by many other NDE researchers in theoretical arguments about the nature of consciousness. The on-going AWARE (AWAreness during REsuscitation) study, a multi-hospital study of NDEs during cardiac arrest, led by Sam Parnia, has a major objective of detecting possible AVPs of hidden visual targets. Until the recent book by Rivas, Dirven and Smit, there was no phenomenological analysis whatever of the collection of AVP cases. The debates in the literature about AVPs have focused mostly on three well-known cases: Maria’s shoe case, the dentures case and the Pam Reynolds case. Skeptics have never been confronted by the full range of AVP cases. This book presents a strong case for the validity of non-physical explanations of AVPs. First of all, it includes only cases of AVPs that were independently verified to researchers by another person. These cases are not simply anecdotes—stories repeated from one person to another—but rather cases that have been studied and thoroughly vetted. Furthermore, the book includes a number of important later cases of AVPs that were not included in earlier analysis, for example, the case of Dr. Lloyd Rudy’s patient. More importantly, the book provides the significant details of the cases and divides them into different phenomenological categories, such as perceptions during cardiac arrest, perceptions outside the reach of physical senses and manifestations of the NDEr to other people. The phenomenological clusters of several cases considered together allow a more thorough examination of possible causes. Physical explanations that cover all cases of a particular type then become more difficult to devise. Indeed, this book poses a real challenge to a number of the favorite physical explanations of AVPs. The fact that each case has third-party corroboration makes it difficult to argue that the perceptions were due to hallucinations, fabrication or confabulation of information derived from other sources. In light of this, it is clear that this book is a very important contribution to the field of near-death studies. The authors have found several additional recently documented cases that will be added to the book, bringing the number of cases to 104. Jan Holden, Ed.D., the Editor of our Journal of Near-Death Studies was the editor of the English edition. NDE researchers Robert and Suzanne Mays wrote the Foreword to the English edition. The project took well over $22,000 including some funds for promotion. The IANDS Board approved an allocation of $4,500 from the PMH Atwater Research Fund and the Board of NetwerkNDE, the IANDS Affiliate in Netherlands, contributed the funds to secure the rights to publish the English translation. Over 90 individuals contributed to the project. To all who contributed to this project, Thank you! !